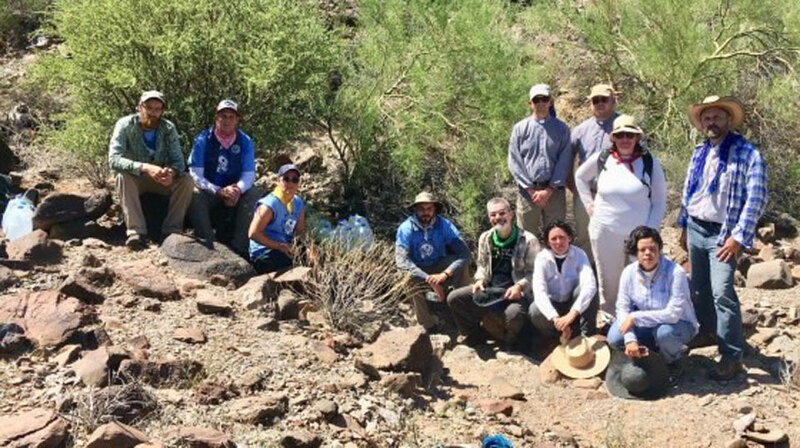 I’ve just returned from a weekend at the border in the southern Arizona desert where I participated in a delegation of 60 faith leaders from around the country in an initiative called “Faith Floods the Desert,” supporting the movement No More Deaths/No Mas Muertes (NMD). It was a powerful and at times overwhelming experience. I’ll try to do my best to do it justice here. As I mentioned in my previous post, No More Deaths is an organization that provides humanitarian relief to migrants, mobilizes search and rescue operations for disappeared migrants, and documents how border enforcement pushes migration into some of the most remote and dangerous areas in Arizona’s deserts. 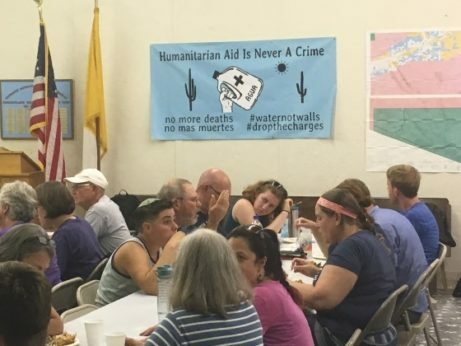 “Faith Floods the Desert” was an initiative sponsored jointly between NMD, the Unitarian Universalist Service Committee, and the Unitarian Universalist Association in response to the increasing criminalization of migrant relief work by the U.S. government. Lunch at Immaculate Heart Catholic Church, Ajo, Ariz.
Our delegation gathered last Saturday in Ajo, Ariz., a small former copper mining town located 40 miles north of the U.S./Mexico border. While the majority of clergy were UU ministers, I was honored to be a part of a five-person rabbinical cohort (with my colleagues Rabbis Margaret Holub, Ari Lev Fonari, Shahar Colt and Salem Pearce). On our first full day, we attended a briefing with leaders and volunteers from NMD, who explained the history and context of the crisis at the border. “With the implementation of this policy, the Border Patrol sought to control the Southwest border by heightening the risks associated with unauthorized entry. To do so, the agency concentrated enforcement and infrastructure to reroute migration away from urban ports of entry and into wilderness areas. By pushing traffic into remote and hostile terrain, the agency speculated that border crossers would now find themselves ‘in mortal danger’ when attempting to enter the US without authorization. 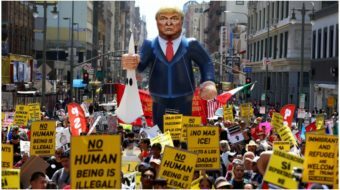 The increased danger was intended to then deter other people from considering the journey, with the overall goal of preventing migration…. In other words, the U.S. government is responsible for the policy that is knowingly causing the migration of immigrants into “remote and hostile terrain”—as well as the policy that sends the border patrol to literally hunt them down. And now our government is actually arresting those who are trying to keep them alive. On Sunday morning, our delegation was split into two groups. 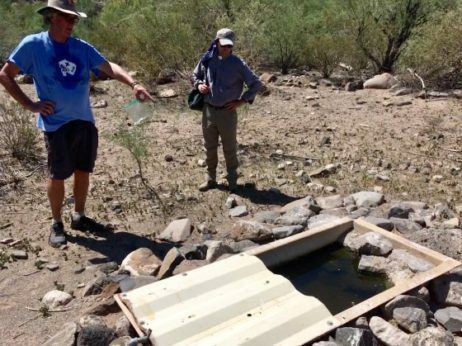 One went south to distribute water via the Devil’s Highway, a well-known and infamous road extending through some of the most remote and desolate regions of the Sonoran Desert. Our group traveled to the Charlie Bell Road, a trail in the Cabeza Prieta Wildlife Refuge along the Growler Mountain Range. Both of these are among the few entrances to West Desert that are open to the public. Our group of 20 consisted of faith leaders, media, and NMD medics and EMTs, and we traveled into Charlie Bell in four trucks. Because our action was well publicized beforehand, we fully expected to encounter law enforcement, and as it turned out, several officers from the Department of Fish and Wildlife stopped us at the entrance to see our entrance permits. They also asked to see the ID’s of everyone who was in the lead car. Although it was not entirely a surprise, volunteers from NMD told us this was the first time any of them had been stopped by the “Fish Cops” at the entrance to the refuge. Feeding trough that provides water to wildlife in the Cabeza refuge. The day quickly became blisteringly hot—by noon it was already 110 degrees. We walked carrying two to three gallons of water each approximately one and a half miles down the trail along the mountain range. 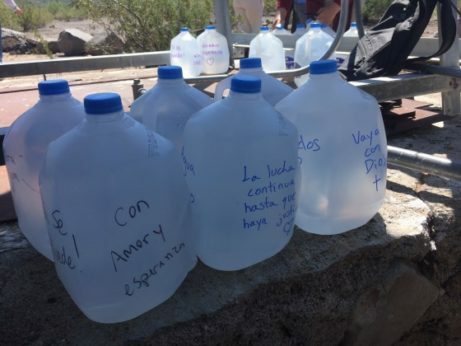 When we arrived at a well marked with a beacon and flag, we wrote messages of hope and solidarity on our plastic jugs of water and set them down. Afterwards, several of us distributed additional bottles at another site close by. This well, by the way, is not intended for use by human beings: It was constructed by the nature preserve to water a nearby trough for wildlife. As we peered inside, we could see that the water inside was dirty and mossy, clearly unfit for human consumption. The irony did not need to be pointed out to any of us: Those who maintain this area provide water for animals, while the water others leave for human beings is confiscated and destroyed. We also saw clear signs in the vicinity that migrants had passed through. Among them: slippers made out of carpet worn over shoes to hide their tracks and a wrapper of electrolyte powder purchased in Mexico. The evidence of the presence of migrants was not hard to find and it all seemed fairly familiar to our NMD guides. 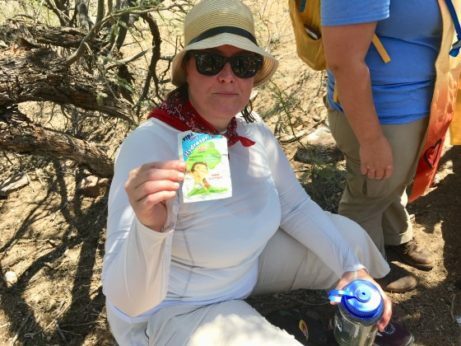 Rabbi Salem Pearce, holding a used packet of electrolyte powder purchased in Mexico. “2. Migration is an organic part of life, a human right and a tactic of survival. “3. The border is an unnatural divide generating industry and environmental harm. Ari Lev speaks my head and my heart. I’ve visited several militarized borders now—and I am more convinced than ever that they serve no other purpose than to shore up the power and profit of those who design, construct and maintain them. Now more than ever we must fight for a world without borders, for a world where freedom of movement over our shared earth is respected and honored. 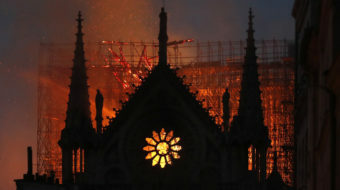 In the meantime, however, we must reckon with the world as it currently is: a world in which nations hunt down those who dare to cross these unnatural lines in search of a better life for themselves and their families. A world in which governments criminalize those who seek to offer them life-saving relief and assistance. A world in which the powerful assume no one will ultimately care about the humanity they deem to be disposable. I’m deeply grateful to those in the UUA and UUSC for convening this delegation, the volunteers of No More Deaths/No Más Muertes, whose work taught us simple but powerful lessons about the discipline of human decency, and the wonderful people of Ajo who opened their community and their homes to us. All photos taken by Rabbi Brant Rosen. Reposted by permission of the author. 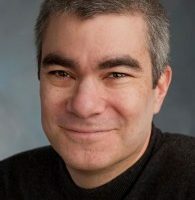 The original posting on Rabbi Rosen’s blog Shalom Rav can be found here.